Are brains preserved using ASC still biologically viable? What is a "connectome" and why is it important? Does ASC preserve the connectome? How can you know that ASC brains can be stored for centuries without actually storing them for centuries? Should we start using ASC on humans right now to preserve their brains for future mind-uploading? Speculatively, what needs to be done to make ASC viable for human preservation? ASC, (aldehyde-stabilized cryopreservation) is a brain-banking technology that can preserve all of the synaptic connections in a whole mammalian brain for longer than a century. ASC uses glutaraldehyde and ethylene glycol to stabilize and preserve the brain's structure. See Introduction to ASC for a brief introduction and the Cryobiology paper for the full details. "Biologically viable" means that the preservation process can be reversed, and the preserved brains will continue to function. ASC is certainly NOT a viable way to preserve brains! The process of chemical fixation with glutaraldehyde irreversibly crosslinks proteins and prevents meaningful metabolic activity from occurring. It is not possible with current technology to reverse aldehyde fixation, and it would be extremely difficult to develop such a technology. ASC is only concerned with preserving the brain's detailed nanoscale structure (its "connectome"), not its capacity for metabolism. Connectomics is a bottom-up approach to understanding as a network which performs computations. At its core is the idea that the brain can be accurately modeled as a massive interconnected network of computational elements. A connectome is a description of this network. Some connectomes are rough sketches of the connections between large regions of the brain, while others are detailed diagrams of all the connections between every neuron in an animal. A "complete connectome" would be whatever level of detail you need to fully describe the computations performed by the brain. See Sebastian Seung's TED Talk for a good introduction to Connectomics. Dr. Hayworth, President of the Brain Preservation Foundation, contends that the sort of information you can get from detailed electron micrographs of preserved synapses, combined with "general" knowledge of how neurons work, is likely to serve as a complete connectome. See the Brain Preservation Foundation's "What is a connectome" page for further discussion of the definition of the word "connectome". …storage with such fidelity that the structure of every neuronal process and every synaptic connection remains intact and traceable using today’s electron microscopic (EM) imaging techniques. The key phrase here is "traceability": can you easily tell where every neural process is going, and do they all terminate in reasonable structures, or is there morphological damage? In Mikula's paper, he does a very formal evaluation of his technique by comparing the tracing results of expert human tracers; if they all agree on which synapses trace back to which neurons, then they must have been clearly preserved. This is a FIB-SEM video of neuropil in the rabbit hippocampus which was banked using ASC. The dimensions of the video are 22x24x5 microns, and each voxel is 16 nanometers on a side. This video is from the ASC paper. As you watch this video, you'll see a big neuron cell body appear in the center of the video, and you will also see many darkly-stained myelinated axons snaking their way through the neuropil. 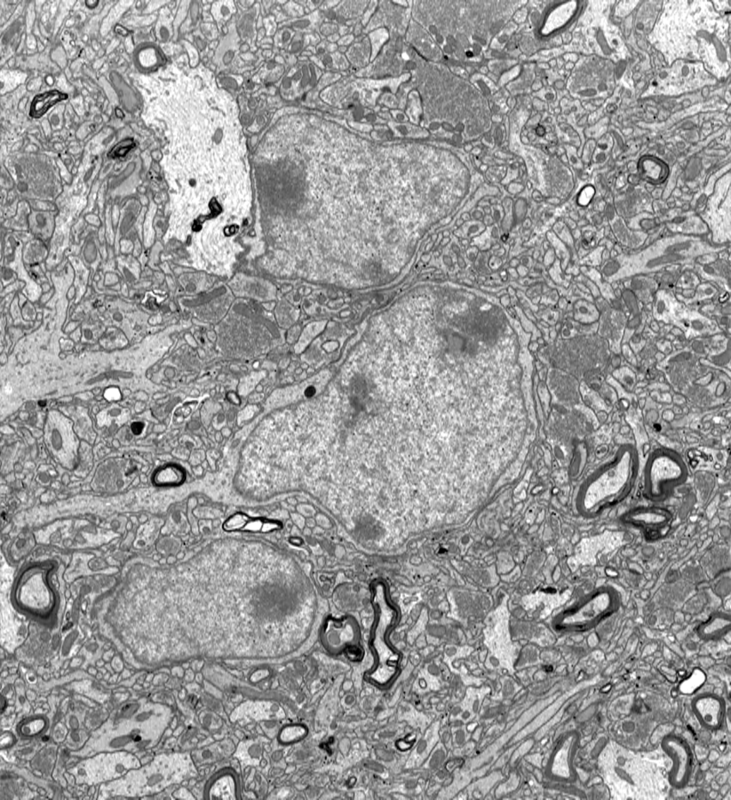 Every tiny dark line between two processes in the image is a synapse; the tiny circles near the dark lines are vesicles (tiny bags) full of neurotransmitter. There's a lot of examples of control electron micrographs available at the Open Connectomes website: http://openconnecto.me/catmaid/. Compare these images to those in ASC preserved brains. The two main issues that might damage brains stored with ASC are freezing (formation of damaging ice crystals) and slow chemical degradation. Freezing is not an issue: We use 65% ethylene glycol as our CPA and ensure that it's fully delivered to the brain by perfusing for an entire hour at full concentration. 65% ethylene glycol is amazingly effective at suppressing ice and forms a thermodynamically stable glass during vitrification. This means that even if you put a ice template crystal into the mix, the cryoprotectant mixture would simply destroy the harmful crystal. The cryoprotectant is intrinsically stable and won't ever freeze regardless of the cooling and warming rate. Chemical degradation is also not a problem: Fixed brains, even without being stored at -135°C, are already quite stable themselves. I've kept a fixed brain at 4°C for several weeks without any structural damage! (an unfixed brain would suffer severe structural damage during this time). So we know that at least a week at 4°C is tolerable. Naively considering the decrease in diffusion times using the Arrhenius equation, we see that 1 second at 4°C is equal to around 5 hours at -135°C. In fact, the time dilation will be much more extreme due to vitrification and a second at 4°C will be more like a year at -135°C. However, even with conservative assumptions of time dilation modeled only by the Arrhenius equation, we get 100 years @ -135°C = 2.2 days @ 4°C, which is well within our safe timeframe. (100 years is the target for the brain preservation prize). NO. Absolutely not! Using ASC on humans right now is irresponsible and implies unsubstantiated confidence that ASC preserves the memories and information contained in a human brain. It's also irresponsible to use a technique that's only just been demonstrated in small mammals in a laboratory setting on humans! Memory preservation is quite a BIG claim, and big claims require big evidence to support them. Although the PRELIMINARY evidence supports the idea that ASC might preserve memories, it's important to challenge ASC in open scientific debate and address the objections that are raised. At a practical level, ASC has only been demonstrated in research animals (rabbits and pigs) under ideal conditions, and would need to be developed into a very robust technique that could be applied clinically to be of use in humans. For a carefully considered view of ASC's application to humans, see Dr. Hayworth's opinion piece. There needs to be a major scientific debate over the question of whether ASC is sufficient to preserve memory, with time to address concerns and further replicate the results. Current morphological distortions caused by the fixation process itself such as damaged myelin and the loss of the brain's extracellular space need to either be addressed by improvements to the techniques or comprehensively shown to be irrelevant. Development of a robust protocol for humans that can be applied in a clinical setting. In a research setting, it's not too much of a problem if the technique only works 90% of the time, because the main goal is to develop a proof of concept. For clinical application, the technique has to have a much lower error rate. A clinical technique would have to integrate advanced monitoring of the perfusion and have clear methods in place to deal with any pathologies which may be present in an individual. There needs to be a careful analysis of worst-case scenarios such as ischemic insult prior to the start of the procedure. Application of ASC to humans using a clinical-grade protocol in a research-only context. The technique needs to be proven for humans by vitrifying a whole human brain and then analyzing it with electron microscopy to determine if all of the brain's synapses are retained, in a RESEARCH CONTEXT ONLY. If successful, ASC would then be a favorable brain-preservation technique for brain banks to adopt, and would enable the study of neurological diseases at unprecedentedly high levels of detail. Several prominent neuroscientists should reach a consensus that ASC is likely to preserve memory in humans. Developing human brain preservation is a worthy and important goal, which is why I started Nectome in order to pursue it. But rushing to preserve people with ASC right now without a fully vetted technique would be recklessly premature.